Wish you all a very happy Deepavali. I was thinking to post few recipes before Deepavali this year but lately I have been so busy at work and with kids, it has become impossible to sit down to write something!. My parents are visiting us for a short time and I am celebrating the festival with them after a very long time. We didn’t do much this year but having them with us in itself is a huge blessing. Aayi made a few dishes last week and someone pointed out on FB that this recipe was not on the blog. Yes, I have reached a point where I forget what is there on the blog :). 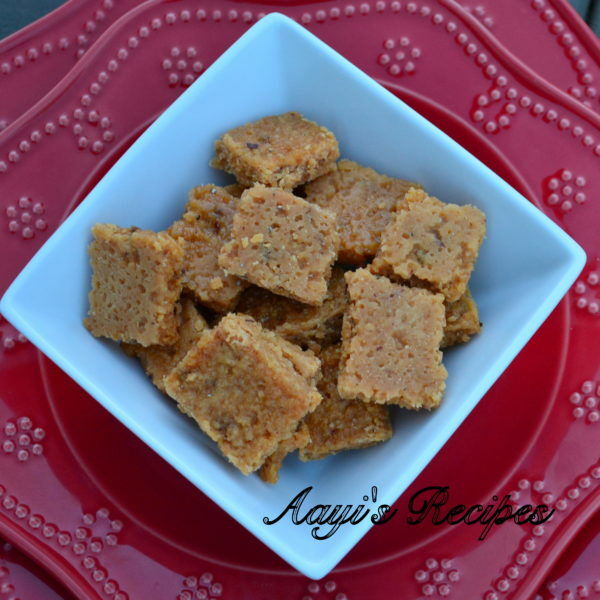 Aayi brought some delicious coconut jaggery burfis (soyi khadi) with her from India. They were delicious, melt in the mouth and fragrant. 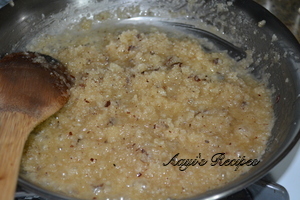 Coconut burfis – soyi khadis can be made with sugar or jaggery. I don’t remember this variety as much as the white sugar variety or the black variety with liquid jaggery (molasses/pattal goad). The batch aayi brought got over in a week, so we made a fresh batch for Deepavali. Apply ghee to a plate or wooden board and rolling pin, keep aside. 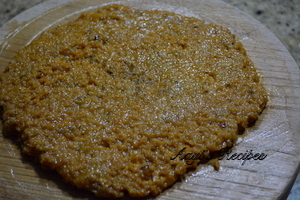 Combine jaggery and coconut in a thick bottomed pan and start heating. Keep mixing on a medium low flame taking care the mixture does not turn brown (it goes from a light color to dark brown within few seconds). 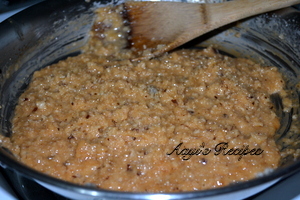 When the mixture becomes frothy and starts leaving the base, take off heat. Spread the mixture on the prepared wooden board/plate. Let it cool to room temperature. Cut them into small pieces. 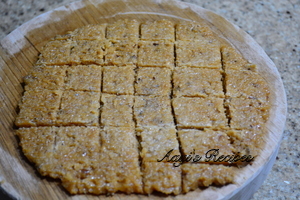 The burfi texture largely depends on the kind of jaggery used. Sometimes they tend to get rock hard. Like any Indian sweet, it has to be removed from heat at the right moment. I suggest trying with a smaller batch first to understand when to stop cooking. OMG I am definitely going to try to make this this weekend! Looks delicious. I was actually trying to search “sandige” in google just to find where I can buy them and ended up in “Aayis Recipes”. i have read over a couple of threads from past 2 hours and this looks great. I feel i should go home right away and ask my mom to prepare them. luckily, I am in bangalore and it takes only 8 hours to reach mangalore. will be back to see new posts…. 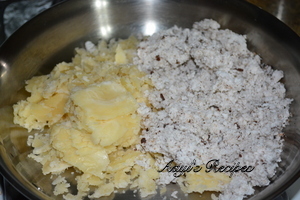 Thnxx for sharing this easy receipe..gonna make it today itself in the evening…shall post the snap….hopefully the jaggery i have turns perfect….